Internet4Classrooms is always working to provide educators, parents, and students with the most useful online tools for your schooling needs. We are thrilled to offer a new, free, interactive ACT/SAT study program that will help students prepare for the ACT Tests and SAT Tests. The concept is this: Each student gets a free account, with a log in name and password, alongside a designated mentor (a teacher or parent). Once logged in, students gain access to 5000 SAT and ACT vocabulary words. They can take online vocabulary quizzes as often as they’d like. Daily and monthly vocabulary lists provide a study guide. There are diagnostic practice tests as well as tips on how to study and master definitions. Students can retake quizzes and see which words they missed. Summary reports and test scores will be emailed to the addresses you provide. Students will get a daily result guide, showing them previous scores, words to study next, and future tests to take. Mentors will get a weekly report with the ability to choose from a drop-down menu to select any student’s progress you would like to view. The process is easy. Go to the sign up page and create an account. Each student must enter in a mentor's information. As a mentor, it’s best to create an email account just for this service. Gmail.com and Hotmail.com offer free accounts. Once you have created an email address, give your first and last name, and the new email address to your students. Each student must sign up by entering in their name and their email address. Select their grade level. They will enter in your information as their mentor. Both you and the student will get a confirmation email with password. You are ready to begin! 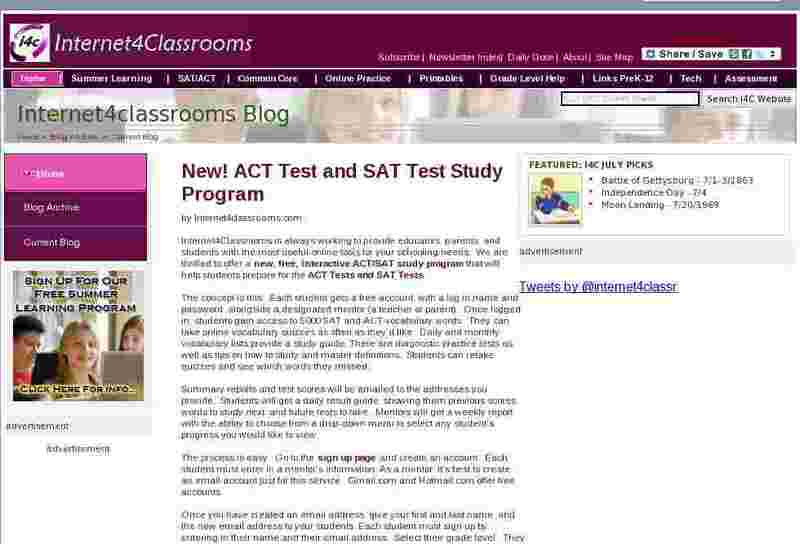 Click here for a tutorial on how to sign up for the ACT and SAT Study Program. We hope you find this tool useful in preparing for the ACT and SAT Tests. As always, comments and questions are welcome. Email susan.brooks@internet4classrooms.com.